Trying to find something that fills you up but that isn’t bad for your waistline isn’t always that easy. 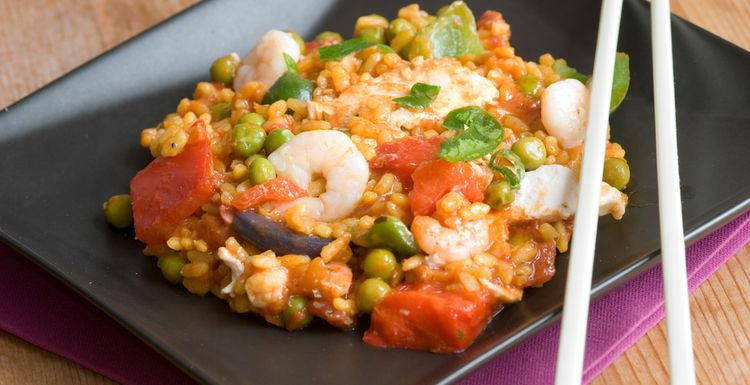 With this hearty paella you’ll feel full and pack a punch in terms of nutrition. Cook the rice, drain and set aside. Dice chicken breasts and king prawns into small pieces. Using a heavy-based large pan – if you have a paella pan, even better - on medium high heat and add the coconut oil. Add the red onion and garlic paste and stir until the edges of the onion have browned. Add the chicken breasts and cook until almost cooked but still slightly pink. Add the prawns and partially cook before adding the paprika and a pinch of sea salt and pepper. Stir. Next add the cooked rice and diced tomatoes. Stir and reduce heat to medium. Pour over the chicken stock and add the saffron. Simmer for a few minutes before adding the lemon juice. Lastly add the frozen peas and stir. When the peas are cooked, garnish with the freshly chopped parsley. I tried this the other night - delicious! I like just a hint of smoked paprika but only put 1 tsp in, and that was enough for me. Cups are easier to use - especially with rice. An easy way to remember is a portion is 1/4 cup, so for four people use a whole cup. 4 cups in this recipe does sound a lot - but it's because it's making up the bulk of the meal. Sean - I'd be a bit wary of doing this in a slow cooker unless it isn't a working day. 8 hours plus will probably make your chicken disappear! I'm a bit puzzled by cups but my cooking tends to be a bit random, so I'm sure it won't make much difference. It looks a lot of ingredients but then I realised I have most of them so will give it a try. Oh this sounds good, Anything with smoked paprika is good in my opinion. Could I make this in a slow cooker?